Use the online Waiver Editor to customize your smart waiver with your brand's colors, logos, and fonts. Add multiple initial and signature boxes in the body of your waiver and instruct your participants to etiher type or draw their signature. Use Smartwaiver's patent-pending Auto Photo Capture feature to automatically capture photos of participants signing your waiver. Create as many waiver templates as you need and display them on one Waiver Index Page. Set up custom questions that will flag participants when a specific answer is chosen. Add a safety or instructional video to the digital waiver signing process. Smartwaiver supports multiple languages including French, Spanish and Dutch. Set up your waiver for Adults, Minors or Adult and Minors to sign. Allow participants to sign your waiver without ever leaving your website. Use the Smartwaiver Button Generator to create a customized web button for your website. Encourage participants to sign ahead of time by adding a link to your waiver in your emails. Turn your tablet into a dedicated waiver Kiosk by using the free Smartwaiver Kiosk app for either iOS or Android. Generate a QR code and use at your location so participants can easily find and complete your waiver on their smartphone. Continue to collect smart waivers when your internet goes down. Easily search for signed waivers by Last Name, Birthday or a Tag that you assign to the waiver. Know how many participants are using your facility each day. Add notes and comments to a participant record after the waiver has been signed. Download all of your participant data to a CSV file and download individually signed PDFs. Set up your waivers to expire after a certain amount of time from signing or on a specific age. Automatically send all copies of your signed smart waiver to your local hard drive. Automatically transfer participant contact information into MailChimp, Constant Contact and Emma. 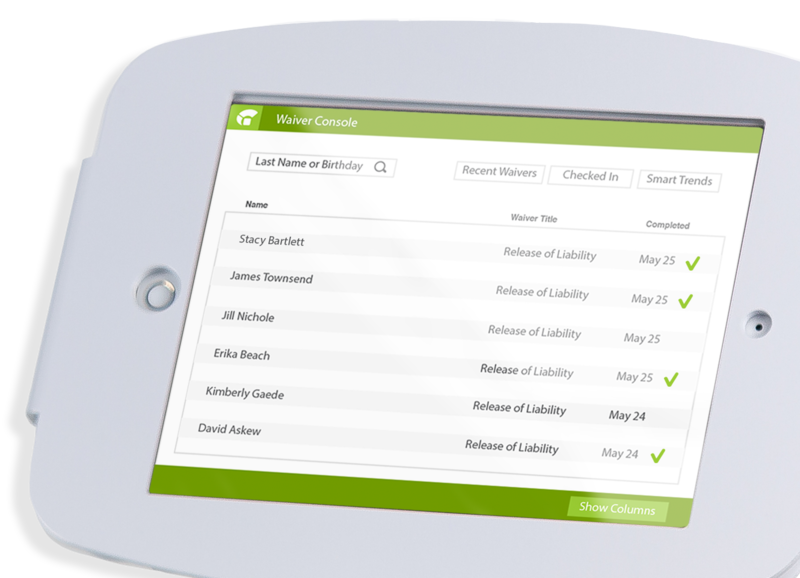 Automate tasks with other popular reservation and member management systems. Administrators of the account can add Staff Users and give these users varying access permissions.